Want the best deal on your tyres? At New Street Garage we a massive range of tyres to suit all motoring requirements whether you're after cheap tyres for your runaround or premium tyres for your sports or executive car. ALL OUR PRICES ARE FULLY FITTED WITH NO HIDDEN EXTRAS. Most other tyre retailers add balancing, valve replacement and old tyre casing disposal at a cost of up to £10 per tyre. Our tyre prices are FULLY INCLUSIVE. 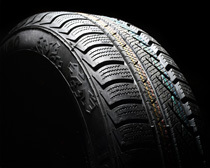 Come and visit us and we will find the right tyres for your car.